Die hocThe state-of-the-art ball sports AXA ARENA in Winterthur, Switzerland, has recently been fitted with luminaires from Thorn and Zumtobel. The glare- and flicker-free light provides perfect conditions for players and spectators during the top clubs’ matches. 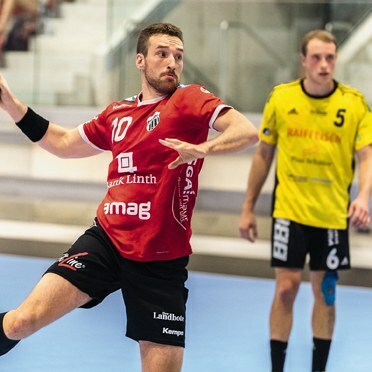 Whether Pfadi Winterthur is holding a handball match or HC Rychenberg is defeating its opponents in floorball – the controllable light can be precisely tailored to everyone’s needs. Winterthur, December 2018 – The city of Winterthur has dreamt of having a professional, modern sports facility for what feels like an eternity, and in 2018, the dream finally came true. Located in the Sportpark Deutweg, the Sport- und Gesundheitsbusinesspark WIN4 was built on a plot of more than 25,000 square metres. The AXA ARENA will be the new home of the top sports clubs from the handball and hockey leagues, but will also be available for recreational sports. This created an important requirement for the lighting plan for the court: in order to create optimal conditions for all types of sport, both during training and matches, the lighting had to be controllable and therefore also flexible. For the professional teams, it’s essential that not only can they celebrate their sporting successes in front of their home supporters in the arena, but can also have it shown on television. That’s why the tailor-made lighting solution from Thorn and Zumtobel provides perfect hall lighting for TV broadcasts. The lighting solution also benefits from being energy-efficient and maintenance free. A bead of sweat runs from the athlete’s flushed forehead across the bridge of their nose, rolling off towards the ground. Razor-sharp, slow-motion images such as this are impressive and make TV viewers feel as though they’re sitting court-side. Creating this effect requires not only the latest cameras, but also very special lighting conditions. Nevertheless, neither players nor spectators should be disorientated or disturbed by reflections of light in the arena itself. Shadows on the court would also be very inconvenient. From an operational point of view, the lighting chosen for the court needed to be both energy-efficient and maintenance free. Working closely with all project participants, the lighting planners and manufacturers found a perfect, balanced combination of Thorn and Zumtobel products. Zumtobel’s CRAFT LED hall luminaire was chosen for the basic illumination of the area. The dynamically adjusted illuminance and light colour support the athletes as they push themselves to their limits. Uniform, low-shadow illumination minimises glare – which is hugely important for players and spectators alike on the shiny hall floor. CRAFT effortlessly meets the high requirements for colour rendering and the stability of light colours needed for TV broadcasts. In addition to the hall luminaire, the project team also used the ALTIS LED from Thorn. The powerful LED floodlight is ideal for illuminating large spaces and is right at home in the AXA ARENA. 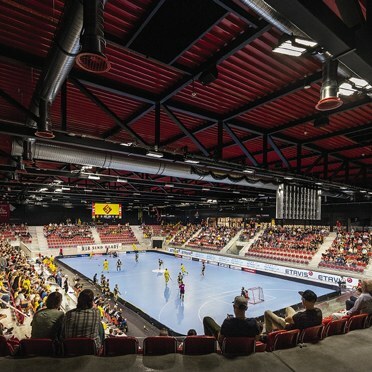 In order to avoid disruptive light scatter, the special luminaire for sports facilities was mounted horizontally on the ceiling struts of the arena. The flicker-free operation of the luminaires enables razor-sharp HD TV transmissions. Tiltable LED modules allowed the lighting design to be adapted to the special requirements. The die-cast aluminium housing and safety glass make the luminaires resistant to impacts, shocks and dirt. And if something should happen, fast plug-in connections mean they can be easily replaced. 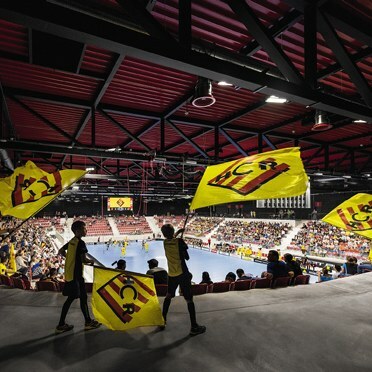 When the NLA teams Pfadi Winterthur and HC Rychenberg meet their opponents in the new sports arena, both the TV viewers and the 2,000 fans in the stands will be given a real show. And to make sure of this, the media planner needs one thing above all else: dramatic lighting! Since the planner works with the DMX signal for the show lighting, the Zumtobel Group technicians quickly installed a DMX/DALI converter in their luminaires. The products chosen are perfect for this because the DALI signal from the luminaires could easily be integrated into the DMX control required by the customer. Both the show lighting and the hall lighting can be conveniently controlled via a DMX console. The decisive factor in successfully combining the various requirements of the sports arena’s lighting plan was the close cooperation between the lighting consultant, Lichtplan GmbH, lighting designers and technicians from the Zumtobel Group. The customer’s requirements for standard-compliant lighting and control systems for sports, TV and shows were precisely determined during numerous discussions and planning meetings, to make sure the solution was exactly tailored to their wishes.